IBM's "ASCI White" and "Big Blue" architecture? 4341 was "Is a VAX a mainframe?" The author Ronda Hauben fights for our freedom. Superduper computers--why RISC not 390? 360 CPU meters (was Re: Early IBM-PC sales proj..
Is Al Gore The Father of the Internet? misc. other 4341 information .... because 4341 needed to be tested with disks ... the disk engineering labs got 4341s before the endicott performance testing groups (who could initially only get sporadic test shots on engineering machines). Since I was providing support for the disk engineering & product test labs ... I actually had better access for testing 4341s than most of the endicott groups. one of the things in the 4341 was significantly improved floating point support ... over the previous "endicott" (lower-end) machines (like the 145). rain/rain4 was from Lawrence Radiation lab ... and ran on cdc6600 in 35.77 secs. Subject: Re: IBM's "ASCI White" and "Big Blue" architecture? Ok, so what's _under_ the hood--is it the S/390 instruction set, or something unique to this machine? just using simple scaling of Mhz (375/200)800mflops gives 1.5gflops times 8192 nodes 12.2tflops ... which possibly yieds the statement regarding 10 teraops? Have turned me into a debugging machine. Running all my jobs under MVT. If the JCL don't get you then the systems will. I put my job in the input queue. And watched in awe as the system blew. I saw on my listing: INPUT STREAM DATA FLUSHED. It may hide forever in SYS1.LINKLIB..."
'Cause the job was in the language known as PL/I. Getting lots of grief from this MVT. Running like a thief 'way from MVT. Getting round this mess via DOS. IIRC, SCIDS is Share Conference Informal Discussion Session. Share is NOT an acronym, it's a verb. As the current slogan says: "SHARE--It's what we do"
Subject: 4341 was "Is a VAX a mainframe?" The other factor was that the 4341 channels were "faster" than the 303x channel directors. The 3330 disk drives were typically access with count-key-data CCW sequence consisting of seek, search id-equal, tic-8, read/write . For paging and 4kblock file access the tracks were formated with 4k-byte blocks with dummy blocks inserted between the data blocks. The 3330 track had enuf room for three 4k data blocks plus 101-byte dummy blocks. The 3330 had 19 tracks per "cylinder" (or arm position). It was possible to block "chain" transfer requests by inserting "tic" (channel program branch requests) from the end of one block transfer (read/write) to the start of the next seek request. The mainframe transfer process has the CCWs located in main memory with the channel "fetching" a copy of the next CCW after the previous CCW had completed. The channel then passes the CCW to the control unit which decodes the operation and sends the appropriate request to the device (disk drive). The 3330 specification called for a minimum of 110-byte "dummy" blocks in order to successfully perform a head switch and read the next record on a different track (and not incure a rotational "miss" ... i.e. the search id-equal CCW is processed after the start of the next data block). The 110-byte "dummy" block has the 3330 drive rotating while the channel is processing the tic (to the next request) CCW and the following SEEK CCW (select different head/track on the same cylinder; no actual arm motion is required). 145 (and 4341) channels were able to process the sequence (tic to next block of CCWs and seek) 100% when a 3330 was formated 101-byte dummy blocks ... and successfully transfer the next data block on a different track (w/o requiring an additional rotational delay) ... i.e. the search request for the next record ... got to the disk device before the start of data record had rotated past the head (if the start of record rotates past the head ... then the disk rotates around until the desired record comes to the head again). 158 channels would only successfully do the head switch and transfer 20%-30% of the time (70%-80% of the time, the selection would "miss" and the 3330 did an additional rotation). All the 303x channel directors were essentially 158 channels in a different package. They tried to compensate for the problem by allowing the 303x channel director to perform limited CCW "prefetch". The mainframe channel CCW processing was defined as synchronous, sequential process ... which allowd a previous CCW to do data transfer and modify the following CCW. Any sort of prefetch would have watch carefully for CCWs being modified after the prefetch. In any case, even with the 303x channel directors doing limited prefetch, attempting to do the head switch & read next record on any of the 3031, 3032, or 3033 models would result in 70%-80% rotational miss (the same characteristic as on the 158). The latency problem in processing is similar but different to the increase CCW processing latency introduced in the 3830->3880 transition. Another problem we saw on the 158 was with fixed-head disks (2505 paging "drums"). It was possible to organizing operations for 4k transfers with head-switch between record transfers ... in much the same way as with 3330s ... except in this case ... there was never any arm motion since every track on the device also had a read/write head. We had a 158 configuration with 2305 controller on the end of a 15' cable and everything worked fine. One weekend they re-organized the machine room and the 2305 controller was placed on a 75' cable (within max. specification) and performance on monday went thru the floor. It turns out that things were right at the border line and the it was starting to miss on every head switch. Back to the 303x/4341 saga ... there was a rumor at the time that the executive responsible for 303xs attempted to address the opportunity by getting the chip fabrication plant to cut the allocation to the 4341 group by 50%. note that any 1.5gflops for a 375mhz power3-ii chip is the same as the kingston engineering and technology center in 1985. Subject: Re: 4341 was "Is a VAX a mainframe?" Couldn't the control unit have been modified (with a "-II" suffix or as a RPQ) to include a track buffer or two? 32KB was certainly do-able in the 370 era and would have allowed read-ahead. Of course, all of the systems I used had "Integrated <mumble> Adapter" logic for the disks, where the strings attached directly to a dedicated spot on the processor (3340's on assorted low-end 370's and a 4331). there were 19 tracks in 3330 "cylinder" ... there wasn't a rotational miss reading the next record on the same track ... it was a problem if you had to switch heads to a different track (at the same arm position) and read the next record (from a rotational position standpoint). To allow switching to any head ... would have required full-track buffering for each head ... with either (19) track buffers in the device or a similar set of buffers in the controller for each device (track buffer would have been about 14kbytes, 19tracks would be about 266kbytes at the device level ... or 4256kbytes at the control level with 16 devices or double that with 32 devices). Putting the buffer back in the controller would have also required 19 parallel data paths between each device and the controller (or a data path that ran something like 20 the head transfer rate). For a string of 32 devices ... it would have to handle something like 3220(3330 head transfer rate) ... 640(3330 head transfer rate). When I looked at the problem for high speed disk transfer ... (actually being able to transfer data in parallel on multiple heads) there was also some problem with the head positioning servo feedback loop. the above involved two processors per complex (total of 16 processors in the single system image complex accessing a couple hundred disks). in any case ... string switch & track buffers in the controller would have required the track read ahead be propagated to buffers in both controllers. the design had high-speed queued i/o where the disk controller had some latitude in dynamically choosen what requests to serve next ... based in part on having access to near real-time input as to rotation position. in that case, the controller (& channel) would need to have CCW pre-fetch ... a much more complex version than the simple one tried for the 303x channel director (or what I did for VAMPS/125 where the controller was actually attached to the memory bus and it was possible to do high speed queued i/o) ... in order to actually know ahead of time which track would be switched to. However, if you were able to do CCW prefetch and know ahead of time what track would be switched to ... then, in fact, there would be no latency problem with not knowing ahead of time which record was going to be read (until it had just passed by the read head and would result in a rotational miss), and it wouldn't be a problem (in the 145, 148, 4341 cases, there was much lower latency and it knew which track it would be switching to ... in time to catch the record before it passed under the head). I had done page formated file system ... which i was trying to get out in the product (which never really happened except for a limited special case) ... and at least for some number of installation ... all 32 drives could be using the same page logic. However, singleton page transfers were the ones that really exhibited the problem. I had also done prepaging ... for multiple page transfers... and a lot went into the file system logic to also do block transfers ... so things tended to be much more contiguous transfers (with head switches tending to occur between end of track and start of track) ... even tho everything was passing thru the same low-level page i/o logic. there was also the idea of doing load balancing across all drives ... potentially getting a little bit of single page tranfer space allocation, multi-page transfer space allocation, file system allocation and misc. other system usage on every drive ("spool", aka unit record & networking temp space also used same disk format & low level i/o queuing routines ... and it was even possible to mix page "overflow" in spooling areas) according to usage & load pattern. we actually did some more detailed investigation on the load balancing, track buffering and caching that involved detailed record activity traces for production systems (there may have even been a patent or two regarding being able to reduce trace information in real time and do various types of system re-organizations on the fly). Two notable projects involved looking at 1) large system configurations movement from 3330 drives to 3380 drives and 2) optimal use of memory chips for caches. For the first use ... the detailed traces should a variety of activities: relatively uniform activity, very low level sporadic activity, and very high level, but bursty activity (some occurring daily, some occurring weekly, and some occurring monthly ... with little or not activity inbetween bursts). It was possible in the migration from 3330 to 3380 to re-org relatively statically allocated high activity and low activity for load balancing across all 3380 drives and at the same time to order placement within 3380 to minimize arm travel (tending to allocate from middle of the disk in bands out towards the edges). The analysis also showed that to maintain the same level of service (access rate/per megabyte of data/per second) on the 3380s as on the 3330s ... only something like 3/4 of the 3380 would contain usable data (i.e. while 3380 thruput improvement increased over the 3330, the amount of data stored on 3380 increased by a larger factor than the improvement in thruput ... filling a 3380 completely full with 3330 data resulted in lower access rate per megabyte of data per second). the other use of the detailed trace data was for I/O cache modeling. Various configurations of caches were modeled for head, arm, device, controller, channel, channel group, and system. Except for full track buffer for handling particular kind of rotational miss, the models alwas showed that allocation of memory chips for caching at the system level was alwas the most efficient use of the chips. This is basically the same as the local LRU vis-a-vis global LRU argument. On the average, over all sorts of activity, it is more efficient to manage the information at the highest level than at a low level fragmented level. The exception is for arm motion plus transfer operations. When the arm is in motion, rotational positioning information was lost. It was therefor possible to arrive at the designated arm position just after the desired record had passed under the head. If there was a full track buffer that could immediately start reading the requested track as soon as the head was synchronized ... then it was potentially possible to catch most of the desired record in cache and only have to read a few dribbles on the subsequent revolution. In part, this was possible since the seek CCW specified both the cylinder and track/head in the same operation ... so the disk knew the desired track before the arm was in position and the head had synchronized for data transfer. The problem with global LRU caches, in a multiprogramming or multitasking environment is that misbehaving operations can "run-over" the data of well behaved operations. As a result, global LRU caches need some method for fencing off ill-behaved operations. Other than that, with all other things being equal, a global LRU strategy outperforms local LRU strategies. It then follows that using memory chips for caching at a global level is more efficient than the same number of chips distributed across local devices (full track caching isn't a "use the data again" cache ... but instead mask disk rotational latency operational caracteristics). a side note ... while 145, 148, 4341, etc had (inboard) integrated channels and were able to do the head-switch using 101-byte dummy "spacer" blocks ... the 168 with outboard channels was also able to do the head-switch reliably with 101-byte spacer blocks. the 158 with its inboard integrated channels missed the head-switch 70-80% of the time because of timing issues in the 158 integrated channels and the (outboard) 303x channel directors had the same characteristic. the 303x channel director was effectively a 158 somewhat repackaged w/o the microcode support for 370 instruction set. The 158 & a channel director supported up to six channels. To get sixteen channels on a 3033 required three channel directors (two directors configured with six channels and one director configured with four channels). i.e. no measurable degradation in system response. refs to system response studies that were used to justify hyperchannel & local 3270s for the IMS group (as opposed to remote 3270s which drove response up to second). i recently ran across a reference that evaluated original 3278 against 3277. a big complaint was with a dense screen rewrite of 3278 (even at 24x80) ... took one second before screen phospher persistance cleared. there was later a 3880-11 control unit (ironwood) with 8mbytes of cache used with 3380 drives (not 3330 drives) that was specific for paging device (i.e. cached 4k byte records, later there was -13 for full-track and eventually follow-on larger caches). the -11 violated the global LRU ... since it was partitioned (if there were multiple 3880-11 in a configuration). It also suffered from a boundary condition problem. a standard ironwood configuration was a 16mbyte mainframe with one or two 3880-11 controllers. The normal algorithm would fault on a page and then read it into main memory from 3380 ... as it was coming in off disk a copy would be left in the 3880-11. Eventually main memory would fill up with pages. At this point there are nearly 16mbytes of virtual pages in main memory and the same 16mbytes of virtual pages in 3880-11 cache (assuming some randomness about page allocation across two controllers). At this point the next page fault would have to replace something in main memory and read the replacement off of disk. Since there was a high probability that every page in real memory was also in the disk cache (since it had been read thru the disk cache into main computer memory) ... the converse is also true ... there was a high probabilty that every page not in real memory is also not in disk cache (because the disk cache was about the same size or smaller than main memory, used similar LRU algorithms for management ... and a copy placed in real memory was also placed in disk cache). That was where "no-dup" came in ... for this type of configuration ... for the cache to be effective ... needed to switch from a duplicate algorithm (i.e. pages in real memory were also in cache) to a no-dup algorithm (pages in real memory were not in cache). For ironwood it was possible to use a different CCW and the read would eliminate any copy that was in cache (and/or not place a new copy in cache if it had to read from disk). In this sort of boundary condition, a "no-dup" algorithm eliminated the problem where every page in main memory had also filled up the cache ... so there was very low probability that a page not in main memory would actually be in the cache (since the cache was full off pages also in main memory). You are never going to get ESCON to do 12.5MB/sec using 4KB blocks. The best rate I've ever seen on ESCON has been just shy of 15MB/sec, and there is NO WAY ESCON can go over that (too many empty frames). I have run Fibre Channel at 35MB/sec and there are Benchmarks around with Fibre Channel running at 80MB/sec. A single DASD controller can handle a lot more than 3000 I/O a second. Hitachi and IBM both claim 32000 IO/sec for Mainframe, but Hitachi also have Benchmarks on SUN at 32000 IO/sec. Mainframe disk superiority is a bit of a strawman argument though, when I have customers running OS390, SUN, HP, DG-UX, and NT all out of the same box. note that low level fiber channel is dual simplex ... aka capable of 100mbyte/sec simultaneously in both directions. It is generally agreed that the IBM 5100 (their first personal computer, except for the price) had a two-level APL interpreter. The hardware had a program to emulate another CPU (either 360 or 1130) and then the APL interpreter was laid on top of that. The question I have is: Was it the 360 or the 1130 machine that was emulated??? Subject: Re: The author Ronda Hauben fights for our freedom. She and I have argued at length in the past about this distortion of the history of it all. The gov't didn't "create the Internet" -- by and large the gov't paid for a LOT of research in communications and systems and protocols ALLOFWHICH is in the public domain and which the public has free access to [and indeed, is making HUGE use of]. Nothing that the [US] gov't was involved in looked ANYTHING like today's Internet. in fact, if the gov't had had its way ... we would have had something based on GOSIP ... the gov't was actually trying to force something other than the internet. NSF did provide funding for nsfnet portion of the backbone ... but there were significant other contributors to the backbone ... larger than that provided by NSF ... and the success of the current internet was much more based on the lack of restrictions for those other portions of the backbone ... than the nsfnet portion of the backbone with its various restrictions. Subject: Re: Where's all the VMers? there is also the folklore about the rather large ISPF development and support group acquiring the VM Performance Tools products (with 2-3 people) and the revenue from those products being used to underwrite the overall group's activities (i.e. P&L was done for the group as a whole ... not the individual products). Subject: Re: S/360 development burnout? Hats & starched shirts were required for salesmen well past when I left IBM in 1970, as well as gathering at 8:15 to sing songs from the IBM songbook at sales school (i.e., before the regular day started at 8:30). My guess is Ronda is a frustrated Che Guevara wannabe. And just as Che ran out of people to "liberate" so Ronda is finding apathy and indifference to her rallying cry against the evils of big business. however, note that gov. regulated had ran out of gas ... vis-a-vis the internet ... even the nsfnet structure was heavily subsidized by big business (even with the nsfnet policy & practices statements) along with the contemparary backbones w/o nsfnet funding & nsfnet policy restrictions. i also remember doing some work in the mid-80s in conjunction with large telescope development project (today possibly the largest land-based astronomy telescopes & university related) for remote viewing. they had a very strong policy of never accepting NSF money because of the related gov. problems & restrictions that would be introduced. they had a concerted program to obtain private funding only. The next guy after that I only met once - a much older guy in a suit that would have been popular in the 50's/60's, patchy skin. A very strange guy (I related it here some time ago). Apparently he was one of the designers of the processor (370/138). various other pieces of either machines may have been designed in other places (I don't know). I worked with various people in endicott on the microcode accelerators on 148 ... which was also made available on other machines. then there was 3031, 3032, & 3033 (3031 & 3032 were sort of 158s & 168s with channel director) ... 3033 was sorta 168 mapped to new chip technology and then some enhancements. channel director for 303xs was 158 integrated channel w/o 370 instruction set. then trout1.5/3090 ... was pok (3033) technology for next generation. kingston technology tended to be closer to the knee of the price/performance curve. pok technology tended to be further away from the knee of the curve going more for straight performance. Subject: Re: IBM promotional items? This has happened to all of my best coffee mugs, too. The last one to disappear featured the name and address of the computer store that sold me my Apple II on one side, and a large six-color Apple logo on the other. I'll be damned if I didn't just leave it in the office dishwasher overnight only to find it gone the next morning. my brother ... a regional apple rep at the time (3-4 states) ... would see "non-apple" mugs from other vendors at customer shops and fawn over them ... telling the customer how great the cup was and would they possibly part with the cup in trade for an apple mug. it worked a large percentage of the time. i've had some really great mugs disappear off my desk at work ... and not to be found anywhere in the building. it got so i stopped bringing really good mugs to work. Not true. Both happened in Poughkeepsie. (I know - I was part of the 155 project). sorry, my incomplete memory ... although i seem to remember when we were working on 16way using 158 processors ... i thot the 158 engineers we were working with were in kingston (although there was one or two former 165/168 engineers that were pok). this would have been '76 or so. Subject: Re: Superduper computers--why RISC not 390? I understand IBM's superduper computers use RS/6000 architecture. Why was that preferred over the S/390 architecture? It may be a scarey thought, but you have no concept of how these sources get lost. If really very easy to lose sources of software that isn't under continuous change no matter how many backup schemes are put into place. I've known several groups who have kept back level versions of operating systems around, just so they could rebuild their code. the group that used VM/370 Release 6 for the basis of the mainframe service processor (i.e. put a mini-mainframe inside the mainframe. the mini-mainframe acts as the service processor for the mainframe and runs a modified version of a mainframe operating system). they made a concerted effort to gather all pieces of the infrastructure so that they could continue to build & enhance service processors on that base ... possibly long after VM/370 release 6 and its associated components were readily available. (before Almaden) and hearing Greg give a presentation on the IBM RP3 which was unusual because it was open (and I remember the DEC guys were in the audience). This was about 1986.
shortly after that ... my wife was asked to do a technical audit of the RP3 project with regard to continuing to fund the effort. the decision was made to not to provide the funding. Subject: Re: RS/6000 vs. System/390 architecture? My point was that there is a belief (amounting almost to a dogma) in some quarters that there should be a single instruction architecture, with hardware on one side and fiendishly complex compilers on the other. This does not strike me as necessarily correct, and none of the arguments thrown at me for its merit held water. the way i remember the activity in the '70s was that the RISC activity was attempting to build reduced cost computing devices and that various hardware/software trade-offs could be made in achieving that reduction in cost ... part of that was reducing the circuit count in order to achieve single (or reduced number) chip implementation. Some of the phases this has gone thru (depending on state-of-the-art) is very reduced instruction sets and instructions that execute in a single cycle. some of the trade-offs were enhanced smarts in compiler and binder (some belief that there had been technology advances that would support such trade-offs). early 801 targets even had single protection domain and that compile and bind/load could perform various verification checks to assure integrity w/o requiring runtime protection (one specially was inline application software could directly swap address-space access registers as easily as it could change address registers ... thus compensating for small number of virtual address space objects ... all of this w/o incurring the overhead of kernel calls to maintain permissions). RISC still seems to have objective of optimizing priace/performance including use of hardware/software trade-offs ... although advances in circuits per chip have shifted where some of those trade-offs are made. The higher the level, the less 'User Friendly' the system becomes. Certain systems will forbid printing without supervisory approval. Good for security, bad for your typical home user. Certain other systems allow remote users to use printers without even a login. Bad for security, very convienent for users. some of this has had to do with where the security perimeter and policies are established. in some cases the computers lay totally within a security perimeter. once thru a physical security perimeter, those computers could be more user friendly since the policies are established via other techniques. in other situations the security perimeter and policies are supposed to be implemented and maintained by the computer, its operating system and applications. between hitting the ENTER key and something happening). By comparison, IBM mainframes of the same generation in the same price range (around $6M in 1975 dollars, when that was real money) would support several hundred users with reasonable response times. same bldg. as multics originated ... 545 tech. sq. ... IBM CSC developed CP/67 and vm/370 (as well as the internal network, GML ... precursor to SGML, HTML, early work in capacity planning and performance modeling, misc other things). In '71-'72 time-frame IBM CSC ran nearly 80 users with mix-mode workload (batch, compiles, interactive, etc) having 90th percentile interactive response under second ... on a single processor 360/67 ... i.e. about the same generation machine as GE used by multics for original development. To some extent multics and the cp/67 shared a common heritage to CTSS. Note however, IBM also developed TSS/360 for the 360/67 and early versions had about the same response characteristics for four users as you mentioned for early multics with eight users. vm/370 on 370/168 in the mid-70s would typically support several hundred users. vm/370s implementation of isolation resulted in it be used in a large number of high security installations. >the way i remember the activity in the '70s was that the RISC activity >was attempting to build reduced cost computing devices and that >various hardware/software trade-offs could be made in achieving that >reduction in cost ... part of that was reducing the circuit count in >order to achieve single (or reduced number) chip implementation. Some >of the phases this has gone thru (depending on state-of-the-art) is >very reduced instruction sets and instructions that execute in a >single cycle. No, no, no! Definitely the objectives of the RISC development, and it was clearly (a) well worth investigating and (b) successful. No argument there. I'm not sure what the no, no, no, refers to. Possibly you were dealing with different people in the RISC community than I was?? I argued in the '70s about the protection domain trade-off and the small number of virtual address objects. The reply was a combination of compiler, loader/binder, and new "closed" operating system targeted for small single task/user environments. The ancilliary discussion about reduced instruction count/complexity to fit in small silicon foot-print. In the late '80s the discussion revolved around not supporting cache consistency for multiple processor applications and simple single cycle instructions ... which would also somewhat simplify the job of the compiler in achieving hardware/software trade-offs. Even tho we had done a lot of SMP work ... the lack of availability of cache consistency was one of the things that forced my wife and I into doing cluster-based work with the chips (as opposed to variouus SMP things). The 801 people seemed to feel very strongly about it at the time ... at least in the discussions i participated in. jata@aepiax.net (Julian Thomas) writes: > Not true. Both happened in Poughkeepsie. (I know - I was part of the 155 > project). doing a little refreshing. kingston would have still been scd/cpd at that time ... before they moved to raleigh. after they moved to raleigh (mid-70s?) some amount of POK, i believe overflowed into Kingston(?). my sophmore year at wsu ... i got hired to write a 360 version of a 1401 "MPIO" that did the front-end tape<->reader/punch/printer for 709.
it was eventually 2000 cards ... maybe 1600 assembler statements. it took 30 minutes to assemble on 64kbyte 360m30 under ospcp6 ... using my own monitor, interrupt handler, input/output supervisor, storage allocation, etc. version down with os supervisor services (dcb macros, get/put, etc) took over an hour to assemble. in the supervisor services version ... there were five DCB macros ... and you could tell by the flashing lite pattern when the assembler hit a DCB macro ... which took six minutes elapsed time per DCB macro (56 - 30 minutes just for five dcb macros). somebody told me later that the person doing the mnemonic lookup (assembler code to instruction) had been given a spec that said they only had 256bytes to implement the lookup. Since the mnemonic codes & the code wouldn't fit in 256bytes ... the table went out on disk ... and every mnemonic decode required disk accesses. Very true - but that was later than the 155-158 timeframes, and it was the larger systems stuff (16x and above) that went up the river. i remember going bike riding with the trout1.5 cpu engineers (on thursdays?) when i happened to be in town. they were all in POK and worked in POK. ASMG also put 5-digit line numbers in the output listing where ASMF ffered only four digits; apparently the ASMF designers never considered the possibility of a source file longer than 9999 cards. HASP easily passed that limit since it its earlier releases the entire product was a single assembly module. in the early '70s i had developed a PLI program that analyzed an assembler listing. it couldn't catch things like branch tables or arbritrary register branching ... but it attempted to reconstruct the logic flow of the program ... and then within each code block determine register use & modification. It identified potential dead-code and also register value dependencies in path flow thru the program. It then attempted to reconstruct the machine language into a PLI-like psuedo code ... using if/then/else/do-until/etc structures. the thing it didn't do well was handle csect/dsect information. I found later when working on a detailed analysis of TSS code structure vis-a-vis VM/370 code structure ... that one of the things the TSS assembler spit-out was the csect/dsect number for each storage reference (i.e. start of listing somewhere had the csect & dsect names mapped to an "ID" ... and each displacement field on the left-side of the listing had the csect/dsect ID prefixing the storage displacement. For dsects ... it allowed generation of variable names with structure qualifiers in an unambiguous manner. random piece of info ... jean worked at ibm boston programming center (also in 545 tech sq, with cambridge science center, multics etc). BPC produced an online pli-based interactive product that ran under os/360 (somewhat akin to the original apl/360 ... but pli instead of apl). BPC was eventually shutdown and some number of the people attached/housed with CSC. Henry Brandt - and who else? brain check at the moment ... who was the guy that had the pencils that said: elect ... lab director, raises or promotions, but not both. henry went on to kingston to work on hippi tied into the page store bus. Were those the days when Andy Heller periodically blew into town? possibly ... but it was before I spent much of any time with andy. it was period around some kind of memos ... i think starting with a T? extraneous bits of info ..... in war games ... the ferry scenes were actually the steilicom (puget sound mainland between tacoma and olympia) and anderson island (with a different name covering up the real ferry name). that ferry is now refurbished and is now a tourist boat on lake washington that runs out of kirkland. Subject: Re: 360 CPU meters (was Re: Early IBM-PC sales proj..
360 mod 50 engineers decided that the way to determine "doing anything" was to monitor main memory usage. This all worked fine in the lab until one fine day someone enabled the location 80 timer and someone else noticed that the meter never stopped running. getting the cpu meter to stop running when nobody was using the system ... but the system was still available for use was important part of being able to offer 24x7 time-sharing services. in large part TCP/IP protocols define a set of message or bit formats and some specific associated services that are suppose to operate on those messages. there is no explicit requirement as to how those messages get generated or processed (kernel services, application programs, user software, etc). That was before ARPA changed it's name to DARPA... a long time ago. Let's raise our glasses to the tribute of Jon Postel, father of the RfCs. didn't the agency go thru a couple cycles of darpa->arpa->darpa, etc. (but as far as i know, it was alwas arpanet). discussion of some of the networking activities going on about same time as nsfnet & early "internet"
Even on OS/360, the normal procedure was to specify the time limit on the job card; then OS would kill the job with ABEND S222 when it hit the limit. However, I seem to remember that OS had trouble completing even a trivial FORTGCLG macro in less than 15 seconds (on a 360/65). a standard fortgclg of dummy return/end was more like 30 seconds elapsed time ... almost all of it job scheduler (just reading & processing the jcl). I had built an MFT (w/hasp) that got it down from about 30 seconds to 12.9 seconds elapsed time. compete with the other academic computer center (IBM OS/360-HASP based) where they had WATFIV FORTRAN jobs that bypassed the accounting system. big win with WATFOR/WATFIV was that it did its own job scheduling ... typically watfor/watfiv was loaded as a single job step (5-15 seconds elapsed) and then it would batch process a tray of student jobs (2000-3000 cards at 50-100 cards per). Typical sutdent job would take small fractions of second ... so total elapsed run time might be 30 seconds. One nice hack that surfaced midway through the life of OS/360 was Addison Fischer's "Executor" that he wrote at West Virginia University. This was a hack of the job scheduler code that supported the majority of the job scheduling functions that student jobs would need, keeping the major job step and allocation management code in memory. This allowed compliant jobs with normal JCL to run with essentially zero wall clock time spent in the job scheduler. we had an ibm advisery SE doing something similar. One weekend (they typically let me have the machine room from 8am sat. to 8am monday ... & I will pull the full 48hr shift ... before getting ready for 10am class) ... i copied his card deck (it was stored in a card cabinet in the machine room) and started "fixing" it. Sometime the next week ... I told him all the stuff I was fixing in his program .. which caused a nuumber of people to get really upset. when we got watfor ... the project was dropped. As I remember it, he did some traffic analysis through GETMAIN and found that some large fraction of all requests was for some relatively small amount of memory (the size of an RB?). So he got a chunk of memory at IPL time, chopped it up into fixed sized pieces that would fit the most common requests, then handled those requests from there. Lincoln Labs ... had a "search list" instruction RPQ on their 360/67. It was used to speed up searching the CP/67 free storage pool for matching storage request. The problem was that even in "hardware" there was still at least one storage fetch for each block in the chain (and there easily could be several hundred blocks on the join on loaded system). Early CP/67 kernel had a number of areas that consumed excess CPU utilization. As these areas were addressed, free storage management became a major remaining factor ... frequently accounting for 20% of kernel pathlenght. Release 3 of CP/67 introduced "subpool" storage management logic. Detailed traces of the system was made and subpool logic created pools for the most common sizes (in some cases ... similar storage sizes were rounded up to the closest defined subpool size). Subpool block sizes were managed LIFO (push/pop). On allocation, a block would be allocated from the top of the list for the corresponding storage size. On de-allocation a block would be placed on the head of the list for the corresponding storage size. If block of the corresponding size wasn't on the subpool list, a block would be allocated from the standard structure. The subpool structure started out empty ... but as blocks of stroage (of the appropriate size) were returned and made available, they would be placed in the appropriate subpool list. This required that all allocation requests (in the subpool size ranges) were rounded up to the next subpool size (in order that generally allocated blocks could be returned to subpools). There was also a cleaning/reset process that took all available blocks from all subpools and merged them back into the standard storage allocation infrastructure. Subpool allocation could be done in 12-14 instructions and in typical system would be used for 90-95% of storage allocation requests. This reduced the storage allocation/deallocation on typical systems from 20% of kernel cpu utilization to about 2% of kernel cpu utilization. The subpool introduction in CP/67 Release 3 negated much of the purpose of the SLT RPQ instruction ... since there was little use of extensive searching in the system. There was a later enhancement to the subpool logic for the two-processor 3081 ... so that storage was allocated on cache lines and in cache line increments. This represented a measurable reduction in inter-cache chatter (and corresponding improvement in performance). For me, realizing that a compiler was just another program was one of those epiphanies where one discovers that one's gods have feet of clay. I put the nails in the coffin of that belief when I started writing my own system utilities, and the gods truly became mortal when my utilities started outperforming the ones that came with the system. i realized early on that there was graduation of system ... as well as the stand alone "sysgen" was actually a fancy application program that I redid to run in the standard jobstream. Normally i would get the machine room all week-end (from 8am sat to 8am mon). However when there was a new OS/360 release ... the ibm'ers would get a couple shifts of dedicated machine time (over the weekend) to do a new system build/generation ... & I would have to work around them. One time this happened ... they had taken a "break" for dinner because something had gone wrong. While they were gone ... I did a card copy of all their stuff and started analyzing it to figure out 1) why they would need stand-alone time ... and 2) what was making things go wrong. I figured out a way that I could do most of the system build/generation procedure with current production system ... splitting it into multiple job steps ... so that if something went wrong ... rather than restarting one 8-10 hr job ... only needed to restart a 10-20 minute job. Also figured out how to re-organize the system build process to optimize placement of datasets and members to improve system thruput. <chuckle> That was one of my full time jobs :-). Did you offer your solution? If you did, how did they take it. That was one of my most difficult tasks. Getting the solutions implemented. while very little of the OS/360 work was adopted by ibm for inclusion in the standard product ... nearly all of the cp/67 work described in the above reference was eventually adopted for ibm distributed product (in part because i eventually graduated and went to work at ibm csc in cambridge). At the start of the 70's the 2305 was much cheaper than core. I recall that a pair of those beasts were attached to the 360-85 2 Mb machine in a dedicated mode for a huge linear programming run (MPS ? MPSX ?) for swap storage before the days of MVS. Can't recall if they were head per track, but they were swifter than 2314s or even 3330s with RPS. RPS doesn't increase the transfer rate of disks, it just makes it possible for a drive to disconnect from the channel until it rotates to a certain point. The effect is to get more throughput out of a lot of drives on one channel, not increase the performance of any one drive. 2305 had eight different logical I/O addresses that could be used by the mainframe for i/o initiation. normally there was a one-to-one mapping between a physical device and a i/o address. Doing one i/o operation at a time (even on a 2305) ... between the end of one operation and the time the CPU started the next operation ... you tended to loose a half revolution. A 2305 setup for 4k pages would have three 4k pages per track where the starting position of each page/record was at the same rotational position on each track. With RPS and (2305) multiple exposures .... it was possible to schedule requests such that the page transfer thruput of the 2305 was near media transfer speed (300 pages/sec) instead of 130 page transfer per second (because of lost rotational delay). I had a battle to try and get multiple exposure support for the 3350 fixed-heads ... which would have allowed the 3350 to do data transfer from a fixed head track overlapped with disk arm motion (i.e. with only a single address per physical 3350 device ... it wasn't possible to initiate a new operation until the previous had finished ... and if the device was in the process of moving the arm, it wouldn't be possible to start a fixed head data transfer until the arm motion had completed). NCP was "layered", but the layers had different functions than what we are familiar with in TCP/IP. Also, be aware that the DARPA research also predates the ISO Open Systems Interconnect (AKA 7-layer) model for networking. In NCP/ARPANet, reliability was provided for in the network and the hosts just assumed and used that service. The NCP model is similar to that used by X.25 (which was really inspired by the ARPANet) in which an intelligent network provides a "reliable" service used by the client hosts. The physical interface between a host and an IMP was also defined by 1822. NCP used the physical interface to exchange Host-to-IMP protocol packets with the IMP (and indirectly with other hosts). Subject: Re: Is Al Gore The Father of the Internet? The transition from that "infrastructure for research and education" to ONE GLOBAL INTERNET is almost entirely Gore's doing. Yes, the researchers called their network "the Internet" and yes, in some sense it is the same network, but the difference is still astounding to those of us who lived through it and helped to push. EARN was the major educational & R&D network outside of the US at the time of NSFNET1 ... and as far as I know was all corporate funded. if i remember right from a intel presentation at sigops (before it starting moving around and was at asilomar) ... one of the hardest problems they had was with the 432 having so much function in hardware ... finding bugs wasn't so bad ... but testing fixes was a real hard problem. Seriously, though, there's no reason why debugging the OS for a capability machine is any harder than for a conventional machine. You're looking at it the wrong way around. Rather than viewing it as having a single wall between system and user code, view it as having such walls at every interface between domains. NSFNET1 backbone ... i believe was a contract for $11.2m for a faster backbone to interconnect a number of specific locations. I've heard rumors that the contract only covered 1/4th to 1/10th of the cost of what corporations were actually putting into NSFNET1 to make it a success. That was aside from all the other networks that were deploying at the time. It may have been all corporate funded (mostly, maybe completely by IBM) but it was not for use by commercial entities (such as intercontinental telecommuters. In other words, it was encumbered with exactly same the kind of acceptable use restrictions as the NSF network(s). question of whether or/not internet/nsfnet was the basis of all networking during the 80s ... a large part of which was devoted to various kinds of email (regardless of whether the network itself was realtime or not). the above reference lists some of the AUPs from the period from different networks and i've included some of the text of those AUPs. Yup, IBM at it again. If I remember right they coined it after RISC became reasonably wide-spread. But of course the definition of RISC isn't clear either. John Mashey has posted more than once an article where he compared different processors to some meanings you might assign to the term RISC. i had contact with the ibm 801/risc group around '76 ... so that they had been doing RISC for some time prior to that time. I believe that John Cocke from that group is credited with originating the term risc. the next time was the 801/risc was going to be used in a project called Fort Knox. Most of the low-end 360-370 processors were microcoded engines of one sort or another. Fort Knox was going to replace all of these microcoded engines with a common 801/risc engine. The 370 instruction set would then be emulated on the 801. This program was eventually canceled (although one might cliam that the current AS/400 implementation using power/pc is some sense a fort knox outcome). There were misc. other 801/risc chip projects ... in this era most of them never shipped as product; things like blue iliad, etc. The next 801/risc that i encountered was ROMP ... which was going to be used in an office machine, displaywriter follow-on product. This product got conceled but the project morphed into deliverying the hardware as a unix platform ... which came out as the PC/RT. The power was the 801/RIOS chip set as a follow-on UNIX product to the PC/RT. There has been a number of generations of 801/rios ... current i believe is power3. Somewhat in parallel with power2 ... there began a joint project, somerset, with various other companies to produce a power/pc ... which begat 601, 603, 604, 620(? ), 630, etc. The 3033 was the last top-line non-TCM machine. I read a performance comparison with an Amdahl machine in Datamation(?) which indicated that the Amdahl was physically as big as it could get without losing its timing, while the 3033 could be almost twice as big. IBM has a habit of tweaking down the cycle time, over time. I suspect the 3033 was designed for this, but it never happened because the 308X series came out. I was also under the impression that the 3033 was architecturally quite sophisticated, for the time. IIRC, the cycle time was 51nS, but that one's very fuzzy. On the other hand, the 3081 was supposed to be VERY simple, because it was the first attempt to marked a TCM-based machine. Because the packaging was SO dense, both on the TCMs and on the Clark boards, and because of their build times,there was a lot of work done on the EC process, so the design could be yellow-wired. They didn't want to bite off too much the first time. The packaging certainly worked. IIRC, the cycle time out of the chute was either 33 or 27nS, but that one's even fuzzier for me. 370/165 & 370/168 were 80ns machines. 165 avg. something like 2.1 machine cycles per 370 instruction. 168 had bigger/faster memory/cache and engineers got it down to about 1.6 machine cycles per 370 instruction. 168 used 4circuit/chip technology. 3033 started out as remap of 168 design to faster chip technology ... which also had about ten times the circuit density per chip. However, the straight forward remap wouldn't have used the higher circuit density and would have only resulted in only about a 20% performance increase over the 168. Work then began on redoing selected portions of the 168 design to take advantage of intra-chip performance ... which resulted in the 3033 being nearly a 4.5-5mip machine (compared to 3.5mip or so for the 168-3). My experience is that testing fixes is no harder or easier, since this is a matter of sofware management, ease of rebuilding test software and scheduling of machine time. However, in general detecting bugs in the OS is easier and more thorough on a capability architecture, since the hardware allows (even encourages) assists the user program and the OS to treat each other in an equally paranoid manner, and so the hardware detects OS bugs earlier in the cycle. If you wrap a hardware enforced segment arround the data buffer you pass to the OS, it makes it much harder for an OS bug in addressing that buffer to go unnoticed. their point was since so much of the function was in hardware ... generating a fix frequently required redesigning & fab'ing a new chip (it was "hard" as in hardware) before something could be tested. it wasn't so much the testing of a fix that was hard ... it was generating the fix (in hardware) that was the difficult part. AOL made the internet what it is today. If Al Gore had never done anything, we would still have roughly the same network, with roughly the same kinds of things on it. Now, I'm not a big fan of AOL's level of user education, but it was companies like AOL, or UUNet, that made the internet change. If the government had refused to pass any laws, the companies would have done it anyway. also note that during the late '80s and early '90s ... the government had switched to and was dictating OSI (GOSIP) ... not TCP/IP. The government was attempting to replace use of TCP/IP with OSI implementations which didn't have an internet layer and would have stopped internet growth dead in its tracks. also most of the internet growth in the 80s was the availability of LANs and the tcp/ip stack on workstations and PCs. Prior to that point, internet had been mainframes and minicomputers with point-to-point connections. 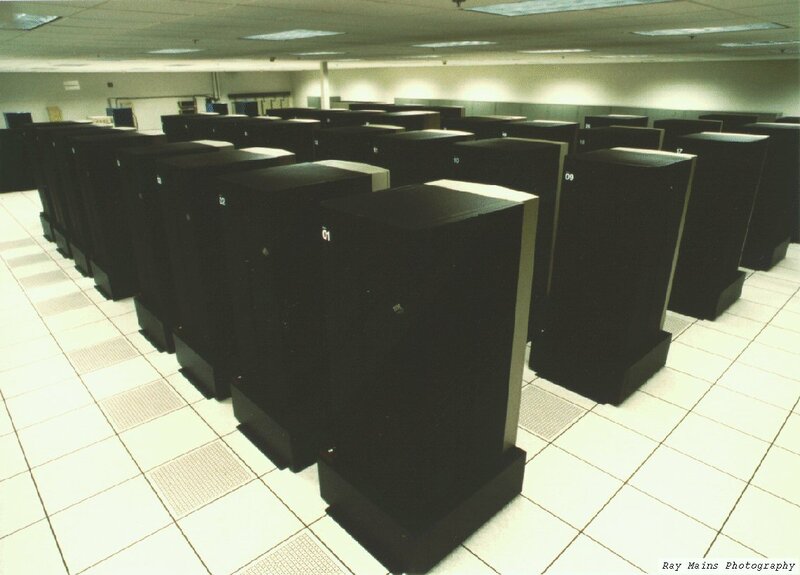 The number of workstations and PCs far outnumbered the number of mainframes and minicomputers that had been the networking nodes. The internal corporate network (distinct from bitnet, earn, etc) reached 2000 nodes about the same time the "internet" reached 1000 nodes. After that there was an explosive growth in internet nodes ... not because of the NSFNET1 backbone (which only directly interconnected a rather trivial number of nodes), but because of LANs, workstations, and PCs all showing in the internet configuration. TCM: Occasionally confused with TMC (Thinking Machines Corp) and TMI (Three Mile Island). i was walking by when a guy started prying the letters TMC off the building ... I stood and watched until they were all off. I thot of asking if I could have the letters ... but had a meeting I needed to get to ... and resumed walking. We had some of those and, indeed, they did very well. But my benchmark shows that the compilers were not really well done. Optimizing some bits in assembler helped quite a lot. 72% improvement on the PC/RT, the MIPS R2000 gave only 45% improvement. (These figures are very atypical. They give information on only one kind of program, integer arithmetic with many multiplies. However, because on both machines the integer multiply was not hardware but software, something can be told from the figures.) If I remember right, the biggest problem was the RT/PC's data addressing part. Offsets from a base register with only limited offsets. Echo's from the 360? there were two completely sets of software for the PC/RT .... "AIX" and "AOS". AIX was a port of system V version 3 done on top of the "VRM". The displaywriter group had done a lot of code in PL.8 (the original risc programming language from the 70s) and in the morph to PC/RT built something called the VRM (written in pl.8) with a virtual machine abstraction layer. The company that had earlier done the port of system V for IBM to the IBM/PC was hired to do a similar port (using version 3) to the PC/RT ... but instead of porting to the bare hardware ... they were tasked to port to the VRM abstraction layer. That is one of the reasons that all of the AIX device drivers were non-standard. The other offering for universities was AOS ... a port of BSD4.3 to the PC/RT. The two systems had totally different compilers. I kinda vaguely remember that. It's been 25 years since I played with a 360. But, it was an 80 byte record, wasn't it? it could be anything ... but the data placed into storage was 24 bytes at location zero ... an 8 byte program status word (PSW) and two 8-byte channel command words (CCWs). The IPL I/O sequence would then tic/branch to the first CCW. Frequently the first CCW was something that read additional CCWs to some location and the 2nd CCW would tic/branch to those CCWs. Eventually the sequence of CCWs would finish and the IPL sequence would load the PSW that had been read originally. The CCW sequence would have read some set of instructions/program into some storage location. The PSW contained the various processor state information and the instruction counter/pointer. Where else was TCP/IP going to be developed??? Name one research lab that was even close to competing with DARPA in that area. Name major contributions that were funded otherwise! the arpanet protocol was a traditional homogeneous networking protocol with IMPs providing the fabric interconnect. Along the way TCP was developed to ride on top of HCP/NCP infrastruction. The development of IP was done later ... by a number of university people. While it is clear that the original work was arpa funded ... it isn't clear to what extent arpa was providing funding for the later IP work (or even the TCP work). although from the following it is clear that DARPA at the time recognized the need for being able to interconnect ARPANET and the other networks. We caught evidence of a Museum guest trying to pry off the IBM sticker logo from one of our artifacts during one of our events. in cambridge ... i was walking from the hotel ... originally was the chart house (back in the '60s) ... now something else (? end of the science museum bridge, locus bldgs are just up river from it) to kendall sq. takes you right by TMC bldg. .... openmarket (and others) had already moved into the bldg by the time they got around to taking thinking machine letters off the bldg. I think that at least some amount of NREN eventually devolved into the government going to vendors and asking them to design and build a demonstration on their own nickle. About that time, I had just come back from giving some talks in singapore ... and a group of vendors were going over. Subject: "Bush administration, Gore spar over U.S. gigbit net"
"Grand Challenges: High Performance Computing and Communications"
"<They're> saying just allocate the money and get out of the way"
"sends an unmistakable signal to industry of the program's seriousness"
"I can guarantee you <we are> committed to this as an initiative"
"We're challenging the government to go beyond what they've proposed"
"The private sector is perfectly capable of building the products. Hans-Werner Braun = HWB@sdsc.edu or Steve Wolff = steve@nsf.gov). II if you submit it as the first job after restarting the printer. note the DOD transition from TCP/IP to ISO international protocols in the attached. of a file or type of file. host. The NIC host is nic.ddn.mil at 192.112.36.5.
by the former NIC, December 1985, and revised (DRAFT) September 1991. Systems Agency (DISA) in 1992.
implementations, including TCP/IP, X.25, and OSI implementations. within DoD, and the GOSIP FIPS draft. ... another (partial) file from the archives ... severely edited to get the size down ... only small part of the ISP listing. Getting Started" (ISBN 0-13-327933-2) is published by Prentice-Hall. and is also available in many bookstores. subsidiary of ANS. ANS is a not-for-profit organization. Services: Network connections; a product of UUNET Technologies. Services: Network connections, dialup IP, dialup e-mail. Services: Network connections; dialup IP; dialup e-mail. Services: Network connections, national dialup IP, dialup e-mail. Services: Dialup access for libraries in the US. (area codes 202, 310, 410, 703). info@psi.com Services: Network connections, dialup IP, dialup e-mail. The purpose of this document is to provide a brief description of the Internet Society and its goals and objectives. It will function as a professional society to facilitate, support and promote the evolution and growth of the Internet as a global research communications infrastructure. The suggestions and recommendations of all parties interested in the Internet are solicited to assist in making the Internet Society robust, productive and structured to meet the needs of its members. The Internet, is a collection of cooperating, interconnected, multiprotocol networks which supports international collaboration among thousands of organizations. Because of its current scope and rapid rate of growth, the Internet will benefit from a more organized framework to support its objectives. To this end, an Internet Society is being formed to foster the voluntary interconnection of computer networks into a global research and development communications and information infrastructure. The Internet Society will not operate the Internet. Internet operation will continue to be a collaborative activity which the Society will seek to facilitate. The Society will provide assistance and support to groups and organizations involved in the use, operation and evolution of the Internet. It will provide support for forums in which technical and operational questions can be discussed and provide mechanisms through which interested parties can be informed and educated about the Internet, its function, use, operation and the interests of its constituents. In 1973, the U.S. Defense Advanced Research Projects Agency (DARPA) initiated a research program to investigate techniques and technologies for interlinking packet networks of various kinds. The objective was to develop communication protocols which would allow networked computers to communicate transparently across multiple, linked packet networks. This was called the Internetting project and the system of networks which emerged from the research was known as the "Internet". The system of protocols which was developed over the course of this research effort became known as the TCP/IP Protocol Suite, after the two initial protocols developed: Transmission Control Protocol (TCP) and Internet Protocol (IP). In 1986, the U.S. National Science Foundation (NSF) initiated the development of the NSFNET which, today, provides a major backbone communication service for the Internet. With its 45 megabit per second facilities, the NSFNET carries on the order of 7 billion packets per month between the networks it links. The National Aeronautics and Space Administration (NASA) and the U.S. Department of Energy contributed additional backbone facilities in the form of the NSINET and ESNET respectively. In Europe, major international backbones such as NORDUNET and others provide connectivity to tens of thousands of computers on a large number of networks. Commercial network providers in the U.S. and Europe are beginning to offer Internet backbone and access support on a competitive basis to any interested parties. Both public domain and commercial implementations of the roughly 100 protocols of TCP/IP protocol suite became available in the 1980's. During the early 1990's, OSI protocol implementations also became available and, by the end of 1991, the Internet has grown to include some 5,000 networks in over three dozen countries, serving over 600,000 host computers used by as many as 4,000,000 people. Much of the support for the Internet community has come from the U.S. Federal Government, since the Internet was originally part of a federally-funded research program and, subsequently, has become a major part of the U.S. research infrastructure. During the late 1980s, however, the population of Internet users and network constituents expanded internationally and began to include commercial facilities. Indeed, the bulk of the system today is made up of private networking facilities in educational and research institutions, businesses and in government organizations across the globe. A secretariat has been created to manage the day-to-day function of the Internet Activities Board and Internet Engineering Task Force. IETF meets three times a year in plenary and its approximately 50 working groups convene at intermediate times by electronic mail, teleconferencing and at face-to-face meetings. The IAB meets quarterly face- to-face or by videoconference and at intervening times by telephone, electronic mail and computer-mediated conferences. CSNET was initially funded by the National Science Foundation (NSF) to provide networking for university, industry and government computer science research groups. CSNET used the Phonenet MMDF protocol for telephone-based electronic mail relaying and, in addition, pioneered the first use of TCP/IP over X.25 using commercial public data networks. The CSNET name server provided an early example of a white pages directory service and is still in use at numerous sites. At its peak, CSNET had approximately 200 participating sites and international connections to approximately fifteen countries. Today, CSNET still provides services to a number of industrial sites and small colleges. In 1987, BITNET and CSNET merged to form the Corporation for Research and Educational Networking (CREN). A key feature of CREN and its predecessors is that they were entirely dependent on voluntary user fees; BITNET from the beginning and CSNET after the expiration of its initial five year NSF grant. following is the list of NSFNET sites ... the sites funded by NSF for NSFNET. Nat'l Ctr. for Atmospheric Res. Nat'l Ctr. for Supercomputing Appl. The House-Senate compromise version of S. 272, the High-Performance Computing Act, passed the House on November 20, 1991, the Senate on November 22, 1991, and was signed by the President on December 9, 1991. This Act may be cited as the "High-Performance Computing Act of 1991". (2) The United States currently leads the world in the development and use of high-performance computing for national security, industrial productivity, science and engineering, but that lead is being challenged by foreign competitors. (3) Further research and development, expanded educational programs, improved computer research networks, and more effective technology transfer from government to industry are necessary for the United States to reap fully the benefits of high-performance computing. (4) A high-capacity and high speed national research and education computer network would provide researchers and educators with access to computer and information resources and act as a test bed for further research and development of high-capacity and high-speed computer networks. (5) Several Federal agencies have ongoing high performance computing programs, but improved long-term interagency coordination, cooperation, and planning would enhance the effectiveness of these programs. (6) A 1991 report entitled "Grand Challenges: High- Performance Computing and Communications" by the Office of Science and Technology Policy, outlining a research and development strategy for high-performance computing, provides a framework for a multiagency high-performance computing program. Such a program would provide American researchers and educators with the computer and information resources they need, and demonstrate how advanced computers, high-capacity and high-speed networks, and electronic data bases can improve the national information infrastructure for use by all Americans. Washington, DC By unanimous consent order issued at 2:59 p.m., Mar 15, the filibuster to defeat S.4, the National Competitiveness Act of 1994, led by Ranking Member of the Senate Committee on Commerce, Science, and Transportation, Sen. John C. Danforth, was terminated. The terms of the consent order did not affect any matter pertaining to title VI of the Committee modification introduced by Sen. Hollings Mar 7, 1993. As the bill now stands, title VI, Information Technology Applications, removes restrictions on the purposes of the National Research and Education Network (Network Program) previously contained in the bill (S.4) reported by the full Committee last summer. Those restrictions prohibited network capabilities in the experimental test bed networks that were available from commercial networks operated by the private sector (Sec. 611(a)(2)(B). They also eliminated restrictions intended to take effect within 18-months on the use of test bed networks to provide commercial network services that could be provided by using commercially available network services (Sec. 611(d)). The substitute amendment now includes language amending sec. 102 of the High-Performance Computing Act of 1991 to require that program funds "shall develop, provide access to, or use communications networks through the acquisition of commercially available network services or through contracting for customized services when such acquisition cannot satisfy agency requirements." (Sec. 102(g)). Sen. Hollings explained at the time of introducing the substitute amendment that the bill "includes language on one key provision--the section ensuring that Federal support for computer networks does not create unfair competition to commercial phone companies, while still providing that Federal agencies remain free to operate their own internal mission networks." A vote on the bill was scheduled for Wednesday morning, Mar 16, 1994. ... here is NREN description from 1996 ... a source of funds for institutions to pay for (commercial) Internet connectivity. NREN will use the Internet to provide information resource connection not only to universities, research centers and government agencies, but also to secondary and elementary schools. The bill provides $2.9 billion over a five year period towards the NREN. The High-Performance Computing and High Speed Networking Applications Act of 1993, sponsored by Rep. Richard Bouche, expands the Gore bill to also include access to health care facilities and and schools at all levels. And the success of each and every one of them is directly attributable to connecting to The Internet. (Notice what happened to each and every competitor that did not embrace the Internet...) You've demonstrated my point rather nicely. Original NSFNET1 RFP was for a T1 speed backbone interconnecting those locations. In the following the reference to the NSF technical audit was at the time the bids had been submitted for NSFNET1. NSFNET2 was for an upgrade of the backbone from T1 to T3. My wife and I were the red-team for the technology bake-off for NSFNET2. The blue team had 20 or so people from at least seven locations around the world. At the final evaluation (maybe 35-45 people in the room), I presented first for about an hour. Then the representative for the blue team got to present. About 10 minutes into the blue team presentation it became so evident that their solution wasn't very competitive, the executive running the show (who apparently had pre-decided on the outcome based on non-technical issues) ... pounded the table and told everybody in the run that he would lay down in front of a garbage truck before he would allow any but the blue team proposal to go forward. At that point my wife and I (and a couple others) got up and left the meeting. was supposedly to pump additional money into computing (HPCC) and communication (NREN) R&D. It isn't clear that a whole lot of NREN money was actually spent for other than funding gov, education, etc. access to "the internet". A consortium of computing and communications companies eager to show off practical applications for the emerging ''information superhighway'' unveiled a new network Tuesday to allow far-flung computer users to instantly collect vast reams of data and then work on it together as if they were sitting side-by-side. The demonstration was the first part of a plan by the National Information Infrastructure Testbed, or NIIT, to create specialty networks in the environmental, health care and education fields -- prototypes of the superhighway that eventually can be sold to private industry or government agencies. In each field, computer users will be able to quickly retrieve information from data bases spread across the country, sort and analyze it according to their needs and share it with other users around the country, using voice and video as well as data. The goal is to move the information superhighway from the potential to reality by proving it can meet pressing social needs -- and make money. ''This is definitely a commercial venture,'' said Jim Lewis, marketing manager at Synoptics Communications Inc. in Santa Clara, who showed off the new network at the Supercomputing '93 trade show in Portland, Ore. Scientists claim the first application, the Earth Data System, would make it easier for researchers to study global climate change, deforestation, world agricultural production and the effects of floods, hurricanes and other natural calamities. The consortium, formed last September and funded by the companies, is one of many efforts to catch the wave of enthusiasm for the superhighway concept. The companies, including American Telephone & Telegraph Co., Hewlett-Packard Co., Digital Equipment Corp., Pacific Bell and Sun Microsystems Inc. in addition to Synoptics, set aside competition to develop common standards for the new information networks. Next year, the consortium plans to create a medical information system to store patient records and allow doctors in different hospitals to share such things as X-rays. After that, the group plans an interactive educational network. The Earth Data System provides virtually instant access to Landsat satellite images of the Earth in a variety of forms. Then, researchers could add a variety of related data, such as photographs of the same area taken on the ground, field notes by researchers on the ground and voice recordings of local information. The data also includes weather statistics, salinity levels and fishing yields. Its designers claim the network is able to move the equivalent of 1,900 pages of text per second, fast enough for researchers to quickly share large computer files, such as satellite photos. The idea is to allow researchers to work together by simultaneously moving voice, video and data. In addition to solving real-life problems, the demonstrations also are designed to work out the technical, financial and legal snags facing the information superhighway. For example, the Earth Data System combines information that is free to the public with archives that must be purchased. Lewis said security and the integration of data from differing formats also present challenges. of the nationwide medical network. An essential ingredient in IT2000 is a National Information Infrastructure, which hopes, by 2005, to interconnect computers in virtually every home, office, school, and factory, and Singapore will probably be the first country to be fully fiber to the home. Many aspects of Singapore's NII will appear similar to those stated in US plans, a high capacity backbone, adherence to standards for networks as well as interfaces and environments, system management and security, distributed computing services, layers of services, and a few significant initial application products. In the case of Singapore these applications include personalized electronic newspaper, media marketplace, distance learning, etc., and others are mentioned, as well as applications of direct value to commercial customers such as a network for procurement, construction, legal network, electronic road pricing, intelligent job placement, on-line income tax info, computerized patenting, geographical information, etc. Many other applications are in the planning or prototype stage. For example, while I was there, an article appeared stating that the NCB and the National University will develop a digital audio archiving/retrieval system to convert Singapore's National Archives 14,000 oral history recordings into digital form. Other projects include communication protocols and software to link pen-based mobile computers on ambulances with computer systems in hospitals. If you want to know about U.S. plans for an "information superhighway," one of the best places to find out is Japan. Seemingly obscure U.S. proposals that are little-noticed here are cited in Japanese newspapers, magazines, books and speeches on Japan's own plans to build a nationwide digital communications network. Such a network -- usually referred to as a National Information Infrastructure (NII) -- would be Japan's largest public works project since the construction of the shinkansen in the 1960's, so the possibilities are being debated by leading industrial companies, corporate think tanks, academia and several government ministries. The debate seems to have little to do with the questions of how or why such a network would be used, but instead-largely reacting to the recent U.S. NII plans -- is driven by technological competitiveness and a desire by electronics manufacturers to find new large and as yet untapped markets. As with all important issues involving national policy in Japan, bureaucratic rivalry is central to both the process and likely end result of the NII debate. Also involved is the mutual dependence and rivalry between ministries and industry as they seek to gain both support and wrest leadership from each other. This brief paper summarizes the policy-making processes at work in the contemporary Japanese NII debate. Because much of the debate is an explicit reaction to U.S. NII plans, it also highlights a few of the major contrasts between those plans. The discussion of Japan's digital communications future is actually framed in terms of three inseparable code phrases: multimedia, information infrastructure and fiber optics. At one end, "multimedia"- the anticipated convergence of audio, video and computing-has been the great anticipated growth market for Japan's large electronics companies for many years. They have developed both new products- such as Sony's handheld Data Discman and Fujitsu's home PC series FM Towns-and hyped existing products as part of an anticipated "multimedia revolution." The link from multimedia to an information infrastructure is straightforward. Only multimedia content- home movies (video on demand), interactive video games, interactive education, and so on-requires the bandwidth to justify a nationwide digital telecommunications network supplanting the existing telephone network. Such a network is the cornerstone of the plans of Japan (and other nations) for an "information society" in which information is conveyed digitally between citizens, business and government, rather than via mail, fax, telephone or television. Meanwhile, Japan has already decided that this multimedia system will be delivered via a fiber optic network. In the U.S., current plans call for a hybrid system for itself based on fiber optics and coaxial cable, because existing coaxial cable TV lines serve the vast majority of U.S. homes. I've always been convinced that the above idea is the reason that the IBM 6670 printer was burdened with the obscene magnetic-card interface, apparently because some janitor forgot to throw the readers out into the Dumpster when the MCST (Magnetic Card Selectric Typewriter) was finally given a merciful death, and the engineers at the OPD facility at Boulder were forced to find some other device to use up the inventory. the 6670 started out as ibm copier3 that IBM San Jose Research added a computer interface for. They then worked with boulder to get it out as a product. I don't remember any reason for the magnetic-card interface ... other than if the copier3 already had one ... or if it was needed to load any sort of information offline. The 3033 64mbyte gave rise to the 16mbyte constrained memory problem. Various kinds of operations (like I/O CCWs) had to be below the 16mbyte line. Some of the early (3033) implementations managing virtual storage ... tended to severely aggravate the 16mbyte constrained memory performance problem ... because of the way they selected virtual memory pages "below" and "above" the (16mbyte) line for replacement (severely reducing the real performance effectiveness of the additional real storage, sometimes almost page-thrashing below the line with very light paging activity above the line). There were lots of situations where pages above the line had to be moved to below the line ... leading to games where the "above" the line area could have pages pushed into it, almost as a kind of paging device. some related problem is that during that period there were operating system "microcode assists" being built for the mid-range machines (4341, 4381, etc). The mid-range machines frequently had a 10:1 emulation ration (between microcode instructions and 370 instructions). Dropping operating system code into microcode was close to a 1:1 mapping (much of the operating system code that got dropped into microcode was status test&update with branching ... which maps easily into the microcode engine instruction set ... and would give a 10:1 performance improvement). The higher-end horizontal microcode machines with lots of hard-wiring for running 370 instructions ... and things usually expressed in machine cycles per 370 instructions. The 165 was 2.1 machine cycles per 370 instructions and the 168 was 1.6 cycles per 370 instructions. The bare-bones remapping of 168 to new chip technology would have just been 20% improvement because of the faster chips (and would have had the same number of cycles per 370 instruction). I don't ratio the eventual 3033 ratio ... but I would expect it to have been less that the 1.6:1 168 ratio (which would have added to the 3033 mip rate). Effectively, most of the operating system microcode assists that were seen on the mid-range machines would see little if any performance improvement on the high-end machines (because they were effectively already running 370 instructions at machine speed, & might even in some cases be slower). This was even more aggravated on 3081 with pageable microcode (i.e. the bare-bones 370 instructions ran at machine cycle speed ... but the more complex "microcode operations" actually might have to be "paged" in&out of microcode store). Can anyone update me on "closed" versus "stealth". If I have a few "closed" ports, is this a big issue?? a host will give back an ICMP "port unreachable" .... presumably the "closed" comes from software shutting down &/or closing a port ... and then there isn't anything to respond to something addressed to that port. ref: rfc1122.txt, pg 39, section 3.2.2.1 (see "3" below). 3 (Port Unreachable), when the designated transport protocol (e.g., UDP) is unable to demultiplex the datagram but has no protocol mechanism to inform the sender.